Yahoo CEO Marissa Mayer Loses Bonus And Stock Award Over Security Breach : The Two-Way A probe by an independent board found that Yahoo senior executives failed to "properly comprehend or investigate" a 2014 security breach. There was a separate breach in 2013. Yahoo CEO Marissa Mayer delivers the keynote address at the Yahoo Mobile Developer Conference in San Francisco on Feb. 18, 2016. 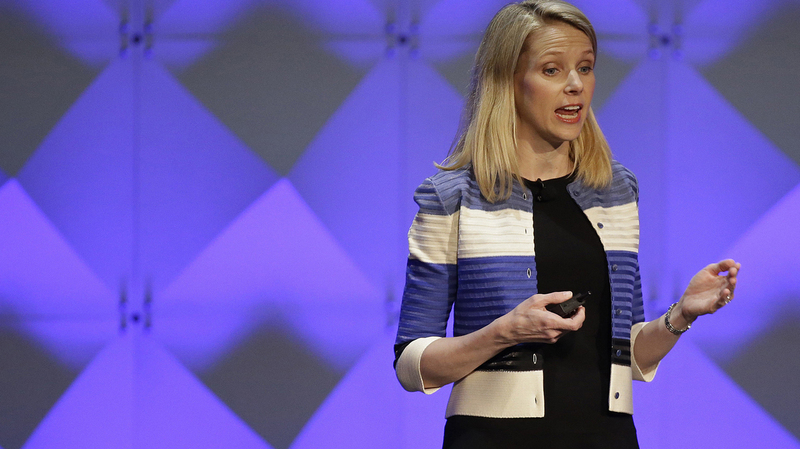 CEO Marissa Mayer will not be paid her annual bonus, and will not receive a stock award after a Yahoo Inc. investigation found that two security breaches at the company were mishandled by senior executives. The probe by an independent board found that Yahoo senior executives failed to "properly comprehend or investigate" a 2014 security breach. In that breach, hackers penetrated Yahoo's network and stole personal data from users. Another breach in 2013 was much larger and affected more than a billion accounts. The board ordered Yahoo to increase its cybersecurity measures. In addition to the action against CEO Mayer, the company's general counsel resigned without severance pay for his department's response to the security lapses. Yahoo's top security officer at the time of the 2014 breach left the company in 2015. "Yahoo already lowered the sales price of its email and other digital services to Verizon Communications from $4.83 billion to $4.48 billion to account for the potential backlash from the breaches. That deal was reached last July, two months before Verizon and the rest of the world learned about Yahoo's lax security. "More than 40 lawsuits also have been filed seeking damages for the breaches. If Yahoo's sale to Verizon is completed as expected later this year, a successor company called Altaba Inc. will be responsible for paying those legal claims. "Yahoo's handling and disclosure of the breaches is also under investigation by the Securities and Exchange Commission and the Federal Trade Commission. The Sunnyvale, California, company says it has spent $16 million investigating the breaches and covering the legal expenses so far." In a blog post on Wednesday, CEO Mayor took responsibility for the lapse in security. "When I learned in September 2016 that a large number of our user database files had been stolen, I worked with the team to disclose the incident to users, regulators, and government agencies. "However, I am the CEO of the company and since this incident happened during my tenure, I have agreed to forgo my annual bonus and my annual equity grant this year and have expressed my desire that my bonus be redistributed to our company's hardworking employees, who contributed so much to Yahoo's success in 2016."